The fire skink is a medium sized lizard renowned for its bright colours. They are found in tropical West Africa, in woodlands, forests, and other densely vegetated areas. Like most skinks, they are a stocky lizard with short legs, a long tail, and hard shiny skin; they are also very brightly coloured, with a gold or bronze back, bright red sides barred with black and white, and as babies their tails are electric blue with a black pattern. Often regarded as shy, once they settle in to their new home they will often pop out to see what’s going on when they hear a noise outside their vivarium. They do like to bury themselves, so a good deep substrate consisting of loose coir and wood chips works very well, especially if there is a good layer of leaf litter over the top. They are an excellent subject for a bio-active vivarium! 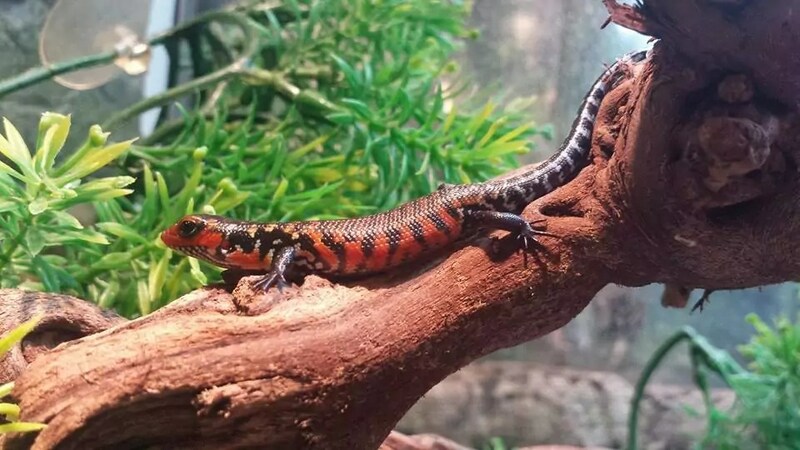 When first hatched, fire skinks measure 5cm (2 inches), and grow to a final size of up to 38cm (15 inches). Females tend to be slightly smaller and more slender than the males, although it can be very difficult to tell the difference unless they are right next to each other. They are not a fast growing species, taking over a year to grow to their full size. 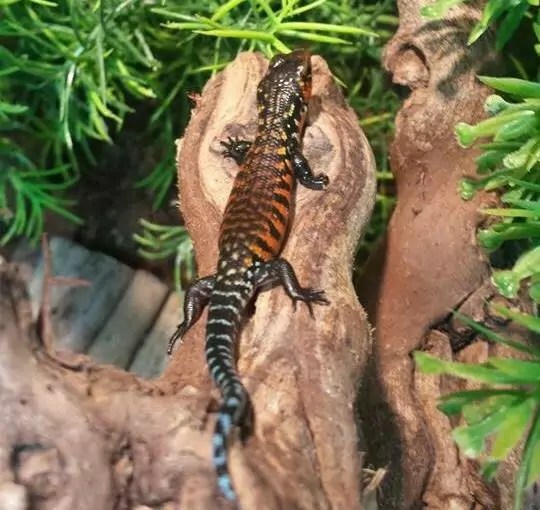 Whilst fire skinks are usually available as wild caught adults, it’s much more sensible to find captive bred youngsters – they are calmer, and much more likely to live to their full lifespan which can be up to twenty years. Even though they spend most of their time on the ground – or buried just under the surface – they do benefit from a good source of UVB light. What we are trying to recreate is the sort of dappled sunlight effect that can be found in woodland, along with a good basking light that will contribute to the effect of a sunny spot for the skink to warm up in. Daytime ambient temperature should be from 28 to 30ºC (84 to 86ºF), with a hot spot of 33 to 36ºC (92 to 96ºF). Night time temperature can dip to 20ºC (68ºF), although it can go as low as 18ºC (65ºF). In common with a lot of forest floor animals, fire skinks tend to be generalists when it comes to feeding. Give them as varied a diet as possible, and don’t forget to dust with a good multivitamin and multi-mineral supplement, as well as calcium. Gut loading the prey is very important as well. Crickets, locusts, mealworms, wax worms, calci worms – you can use them all (of appropriate size, of course) to feed your skink. They also love snails! Unlike a lot of skink species, fire skinks lay eggs. The female will lay a clutch of five to nine eggs after mating, which can either be removed to be incubated separately, or left in the vivarium to incubate naturally. Placing them in an incubator set to 29ºC (85ºF) will give more consistent results; the eggs should take forty to fifty days to hatch. Then the real fun begins! Preferred temperature range: daytime hot spot of 36ºC under the basking light, background ambient of 30ºC, cool end of 25ºC. Temperature can drop to 20ºC at night.